And here it comes. The big question everyone gets asked during the month of October: “What are you going to be for Halloween?” If you're like us, and spent most of this year pinning food images on Pinterest or Instagramming the heck out of your favorite meals, you could consider a food-related Halloween costume. And here it comes. The big question everyone gets asked during the month of October: “What are you going to be for Halloween?” Yes, you could scrounge around thrift shops and secondhand stores looking to piece something together, or opt to wear the same outfit as last year (and the year before). Boring! Or, if you're like us, and spent most of this year pinning food images on Pinterest or Instagramming the heck out of your favorite meals, you could consider a food-related Halloween costume. Spread your love of soup with this Campbell’s Chunky Soup costume for men, and Campbell’s Tomato Soup outfit for women. No heating required. 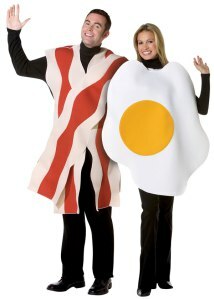 Yes, there are some nutritious costume options out there for the health-conscious. 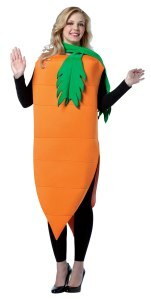 For example, you can pair this carrot outfit with the nearest fluffy bunny for a scene straight out of the garden. Or, if your friend is dressing up as Snow White, why not opt to be the devilishly shiny red apple that changes her life? 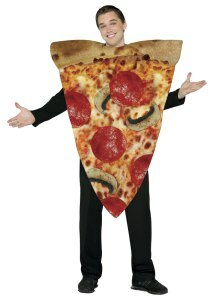 When you have the number for the local pizzeria in your speed dial, wearing this Pizza Slice outfit for Halloween is a no-brainer. Whether you like your PB&J sandwiches made with almond butter or peanut butter, with bananas added, grilled or fresh, or even in cookie form, grab a partner for this classic combo. 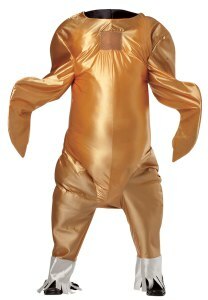 Pre-party it up before Thanksgiving with this Gobbler Turkey costume (baster not included). 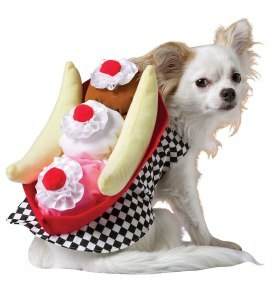 You can choose to go the sweet route, with a Banana Split Sundae or Cupcake outfit, or pick that savory route, with this adorable Hot Dog costume, because everyone deserves to feel pretty. Awwwww!